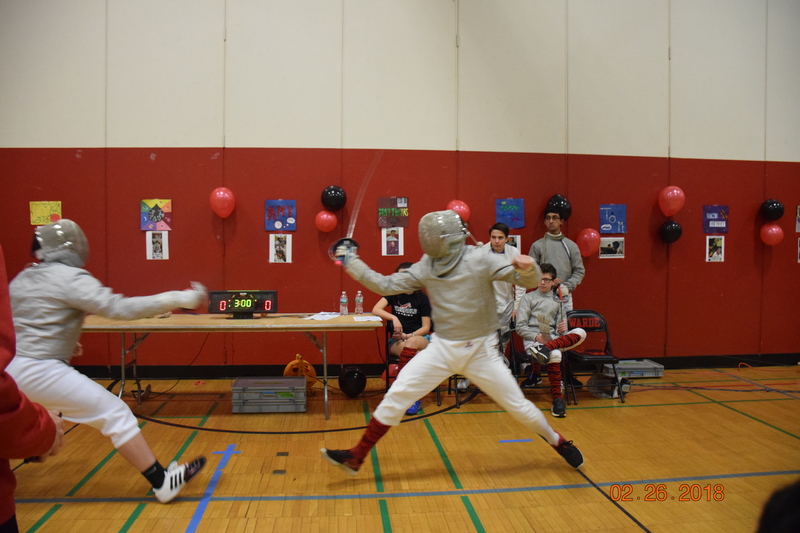 The Fairfield Fencing Team, with students from Fairfield Warde, Fairfield Ludlowe, and Fairchild Wheeler Interdistrict Magnet School, wrapped up the season with many notable successes. The Women’s Foil squad, consisting of Akshitha Maddula and Amy Ngaopraseut from FWHS and Madison Lee and Chloe Girard from FLHS took home the bronze at the team states competition for the second year in a row. Madison Lee placed first for Women’s Foil at the state championships. Lexie Madden placed 10th at the individual state championships on the Women’s Epee squad. Earlier in the season, Lexie Madden placed 8th for Women’s Epee and Akshitha Maddula placed 3rd at the JV tournament. Amy Li placed 7th at the Novice tournament. This team saw a peculiar change this year. While the team used to have practices in the small gym after school at Warde, it came with some issues. First of all, the team only got half of the small gym and Warde Cheerleading would take the other. Only having half of the space was a problem in itself; once you lose another portion of the gym to set up the electrical equipment, it’s hard to fit an around 50 member team giving everyone room to drill. So, coaches Jim Roberts, Justin Dion, and Warde Athletic Director Seth Fry came up with the solution of relocating practices to the Walter Fitzgerald Campus. It was new for everybody and took some adjusting, but ultimately proved to be a really efficient solution. While it took some time for the buses to arrive from both schools and the bathrooms were a little tight, the isolated space really promoted hard, dedicated practices. Plus, there were less distractions now that the team was not next door to cheer and their loud (really loud) speakers. All in all, it was a great season. Believe it or not, you don’t need ANY prior experience to join the team, and it doesn’t matter what grade you’re in. If you want to try something new and are willing to work hard, join the Fairfield Fencing team. If you have any questions about the sport or team, contact captains Akshitha Maddula, Lynne Andre, Chloe Girard, or Aidan Trabuco!